Five months. That’s how long it’s been since the trip. It fells like yesterday. Memories will quickly fade if not cycled on. So this, in no particular order, is what I learned on the trip. The human body can survive off of average four hours of sleep over a week. And thrive. When traveling to a foreign country that has limited cellphone coverage (or your phones frequencies don’t work in) there are other forms of communication. Paper. Seriously. At one point in the trip, the day’s schedule would change so much from the original printed schedule that we didn’t trust it. Ok, I lied. Every day ended up like that. At home, we could all just text each other, update the Google doc, or email each other. No such luck in the Philippines. Ended up using the most ancient system that still works (besides speech). A small group of us would plan the next day based on all the new factors and we would post hand written schedules in each dorm or house. The solution was almost too simple that we overlooked it for too long. So long as everyone knew to expect it, handwritten paper works. Buy a few handheld radios once you get there. Each country has their own set of frequencies and rules on radios, so don’t bring ones from yours expecting them to work. We didn’t go this route, but a half dozen radios wouldn’t have gone amiss. However, having not used them, I’m not sure if they would have become a distraction though. There’s something about radios that gives a free license to talk way into them, for everyone to listen to you. Used correctly and they will allow dissemination of information down a chain. Used wrong and they just turn into a social distraction. Did not bring enough goodies to trade or give away. In Canada (and most likely other developed nations), Scouting is for entertainment, or edutainment. In the Philippines, Scouting is Life. The local Barangays (That’s village or ward for you) we visited had many services that were run by the local Scouting community. Not small time services, but core ones such as search and rescue, and one even ran a successful credit union. The level of community involvement is something one could only dream of here. I will finish this thought with an amazing story. Cainta was one of the areas most affected by the flooding in September 2009. We’re talking 6 feet of water in an hour. During this time of crisis, some of the youth went to save their uniforms first. First. Above everything else. How many of us could honestly say that? Every Eagle Scout (Queen’s Venturer equivalent) gets an ID card with a registration number on it. It’s a way to bring together the idea that they are part of a greater legacy. It’s their proof of accomplishment. This allows members of the trip to be fully aware of what’s expected of them and what will happen that day or the next day. So much headache and friction can be relieved simply by letting people have a say in what happens, prepare for what they have to do, and vent concerns. Debriefing allows feedback and sharing of stories. With so much going on, people miss out on some details. By sharing the crazy stories and the insights as a whole, group bonding is accelerated. I can not emphasize how much this would help any trip. The larger the group the less that some people know. Proper dissemination of information makes life smooth. We didn’t do this for the first week or so, and the group was ready to tear apart. Didn’t help that the first week was also the craziest schedule I have lived in my life. Those that know me will know that I live a crazy schedule as it is. More pre-trip adjustments should have been done. Learning some local language and setting expectations before we went would have been beneficial. Now that is straight from my notes while on the trip. I am unsure now which meaning “setting expectations” I meant; expectation of surroundings or defining expectations. At this point, both are equally valid. Part of the wonder of the trip was the slow reveal of the different facets of life; learning what we could about their society by experiencing it first hand. The Philippines have the third largest Scouting population in the world. However, their Rover program is in dire straits. If you compare the size of the Rover population to the Venturers in Canada, we come up with a figure of 16%. The same calculation in the Philippines is 4%. 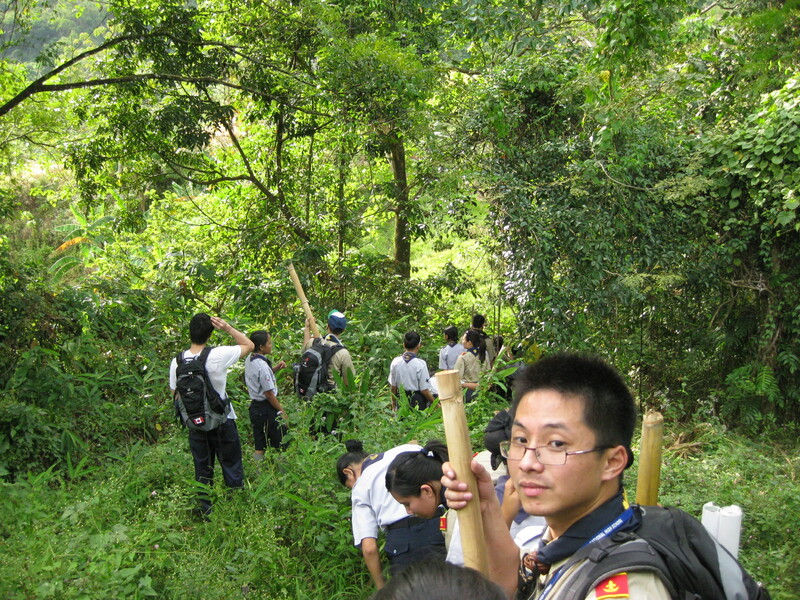 After high school, the youth drop out, seeing that Scouting is part of their youth, and not their adulthood. They weren’t being given proper roles for their age, and saw no point in waiting 20 years to get a role that meant anything. Hopefully we can learn that lesson from them. A pamphlet with a map of Canada, diagrams of how Scouts Canada works would have been useful. Meeting so many people, it would have made life easier and conversations fuller by having something. There really should have been a separate team devoted just to photos, video and blogging. When we tried to cram all of that in at the end of the night, and sleep, and prepare for the next day… well you can see where that 4 hours came from. In general, planning for more maintenance time at the end of each day would have provided a smoother trip. If there was one main message for me to take home from this trip, community involvement is key. Completing meaningful service feeds a need deep inside a human, and will keep adults and youth involved. If general society can see that you are providing meaningful service (outside of just the scout program, but more direct community service), your work is celebrated. Inspiring our younger members is the only way forward to grow. When they see great accomplishments done, they can only turn to emulate it, to aspire to do the same. If we want a dynamic organization, we have to be willing to complete the tasks that wow and inspire. This entry was posted in Lesson of the Day, PCC Rover Crew, Philippines International Trip. Bookmark the permalink. Nicely said. Except you duplicated the bit about the ID card. Still, lessons to be taken to even stuff happening within our own Country. Sometimes the tech becomes a hindrance, not an asset.